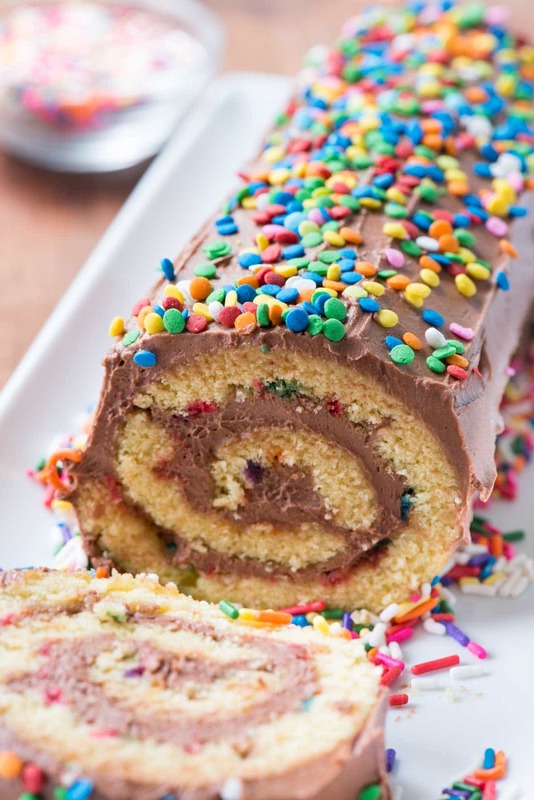 Birthday Cake Roll – this easy yellow cake roll recipe is filled with sprinkles and the BEST EVER chocolate frosting recipe! Everyone loves the birthday cake but they RAVE about this frosting. 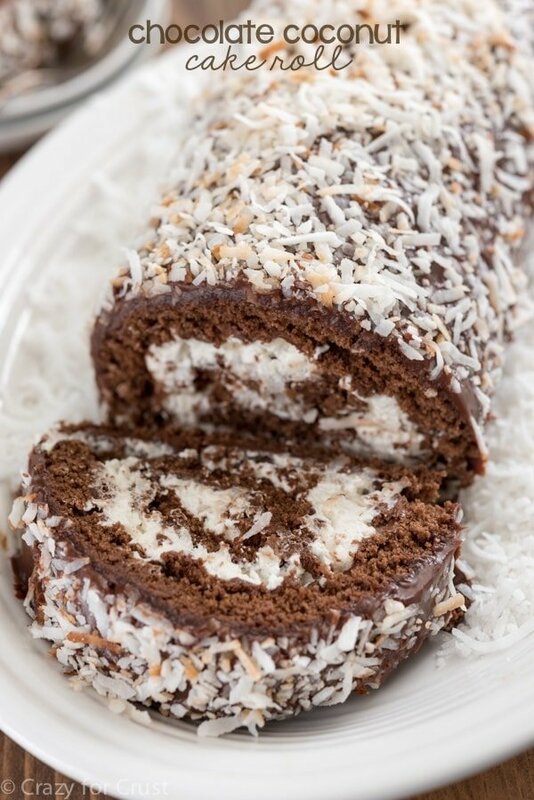 I’ve gone 2 whole months without posting a cake roll recipe, so I felt it was time for another one, ha! This time it’s all about the BIRTHDAY CAKE! With sprinkles, of course. Last week my mother-in-law turned 80. The entire family flew in from San Diego to surprise her. We had Jordan and the great-grandkids go to her front door to surprise her. I gave Jordan my phone to video tape the look on her face…and she forgot to record. But that’s okay – she was super surprised and even got teary. That’s what big birthdays are all about, right? Well, that and cake! Since she’s the one who taught me how to make cake rolls, I thought it was fitting to make one for her as her birthday cake. I love a good old fashioned birthday cake: yellow cake with chocolate frosting. I decided to turn that cake into a cake roll and add sprinkles, because sprinkles make me happy. The yellow cake base is the one from my Strawberry Shortcake Cake Roll. I have a few chocolate frosting recipes I love but I wanted to try something new; something fluffy and light and rich. This frosting is the PERFECT frosting. I know I say that a lot, but this one is now my go-to frosting recipe. I’m never making regular old chocolate buttercream again! Everyone loved the birthday cake roll, but they especially commented about the frosting and how good it was. 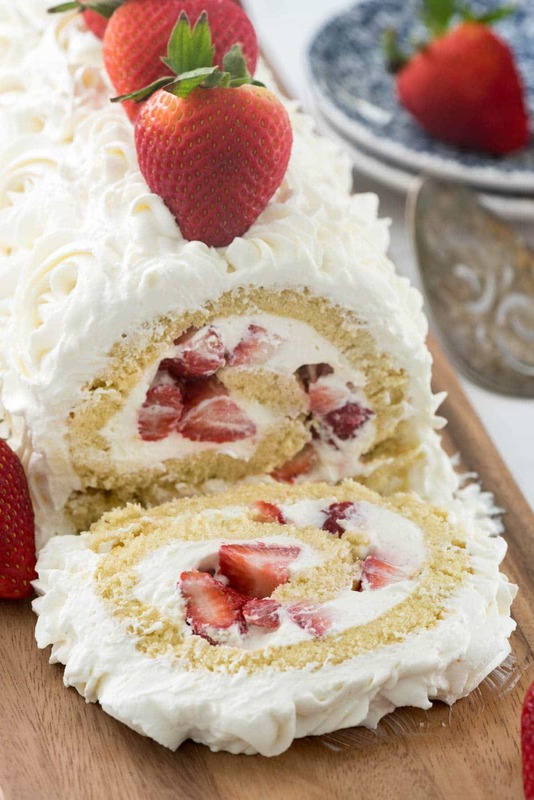 If you’ve never made a cake roll before, don’t worry. It’s super easy, I promise. You just need a jelly roll pan which is usually about 10×15″ with 1-inch sides. 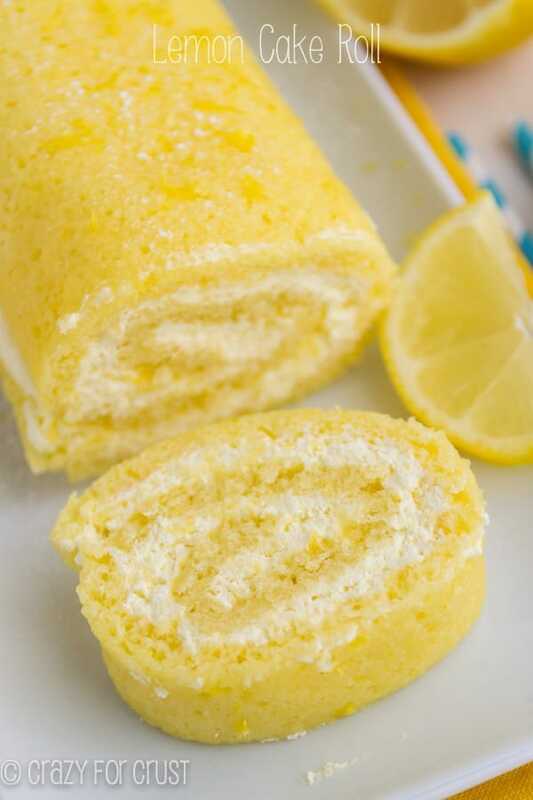 I get asked all the time if you can use a cake mix to make a cake roll, and you can, but you need to edit the recipe a little. My cake recipe tastes better too – but if you really want to use a cake mix, try this recipe with your favorite mix. Peanut Butter Cup Cake Roll – with a full video on how to make one. I’ll be posting a video on Facebook later today for this birthday cake roll, to show you what an easy cake recipe this is. You’ll notice that the sprinkles sunk to the bottom of the cake. That’s going to happen if you stir them in (gravity and all that). To combat this problem, add some more when your batter is in your pan. Be sure to use quality sprinkles. I used a cheap grocery bin kind and they somewhat melted. I knew I should have used the good ones but I went against my better judgement. For best results use Cake Mate Jimmies, not nonpareils. They sell tubs of this brand at most grocery stores in the baking aisle and I never have a problem with them melting. Don’t be afraid to over bake the cake a bit (over done is better than underdone for rolling) and, as always, roll it while it’s hot. Then let it cool, unroll, then fill. You can see there are some cracks in mine. Oh wait, you can’t really see them, right? Unless you look hard? Frosting saves the day, every time. Just keep rolling and press it back together. Why does it crack? It’s not baked enough, it’s baked too much, it’s Tuesday. Some work, some don’t. For a fluffy cake, do not scrimp on the egg beating time. I know, it’s a long time to stand there with a hand mixer. JUST DO IT. The chocolate frosting is seriously the best I’ve ever had. It makes just enough for this cake, but if I ever make it for cupcakes or a layer cake, I’ll double it. 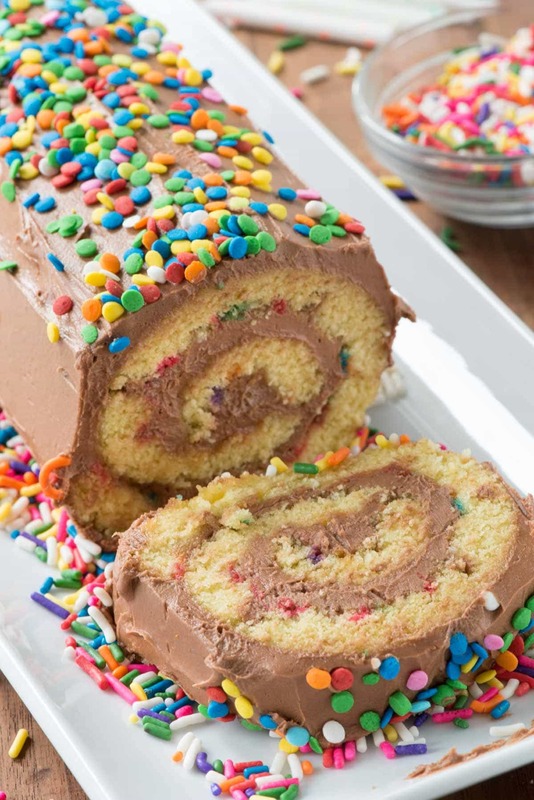 Birthday Cake Roll - this easy yellow cake roll recipe is filled with sprinkles and the BEST EVER chocolate frosting recipe! Birthday Cake Martini, from Living Locurto. Birthday Cake Funfetti Trifle, from Melissa’s Southern Style Kitchen. No Bake Birthday Cake Lasagna, from Wine & Glue. Is it possible to make this ahead of time and/or even freeze for days before serving?